Right field was patrolled by "mountain goats", not because the players had long chin hair or bucked anyone, but because right field rose on an incline of 25 feet, beginning gradually behind first then rising at a 45-degree angle for 224 feet. The hill leveled off for a 10-foot-wide shelf then continued to rise to the fence. Fielders played on this shelf. When there was an overflow capacity, rope was set up behind the shelf and fans sat on the incline that led to the fence. This reduced the distance to right field from 262 feet to 235 feet. The original diamond was here in the 1860s, but the park was not built until 1885. During the winter of 1926 to 1927, the park was torn down and rebuilt with the diamond facing the other direction. 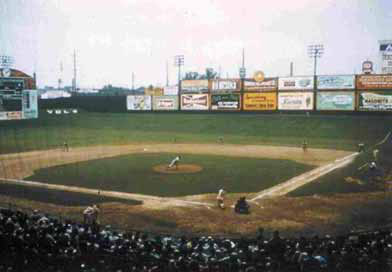 You could still see the old basepaths until the park was destroyed in the 1960s. 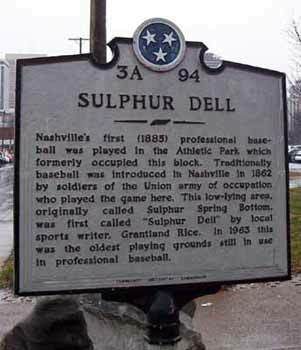 This park was called Athletic Park until Grantland Rice, sports editor of the Tennessean, renamed it Sulphur Dell. 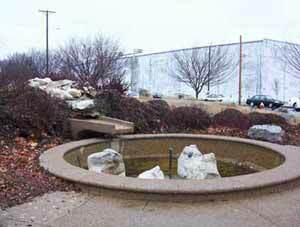 This was the location of the sulphur spring and salt lick that caused buffalo, hunters, Native Americans, and pioneers to this area, located near "Big Salt Lick" or "French Lick". 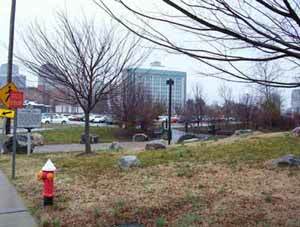 This park frequently flooded, due to its proximity to the Cumberland River. 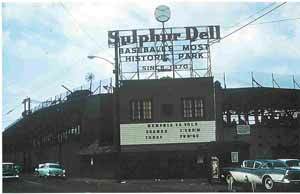 Its nickname was "The Dump" because it was located right next to one. © 2004-17 Paul Healey, except where noted.